It’s a fun stunt to try and taste the decades of your life via bottles of wine. As one gets older, it becomes ever more difficult as the older wines get more scarce, somewhat giving you a cue that your time might be nearing its pull date as well. But 40, that’s a pretty doable age as there are a wealth of wines that can age that long, although their prices get quite precious. A friend in Priorat, Fredi Torres happened to have almost the same birthday as me and he was planning his for some time with the benefit of many people in wine distribution. Coming at this in the last moment, I did the best that I could and while managing to get wines from every decade, they weren’t all 7s (1977, 1987, 1997, 2007) but so it goes and the vinous journey was still one to behold the other night. 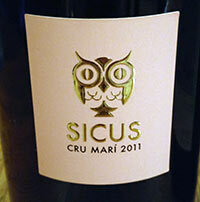 Of course we were already breaking with the rhythm of the seven theme as welcoming friends, I had opened a bottle of the Sicus Cru Marí which is an sparkling wine made in the ancestrale method and based on the grape, Xarel·lo Vermell. This is a pinky mutation of the much more well-known white Xarel·lo grape and the wines that Eduard Pié is making with it are definitely worthy to note. This held excellent acidity while being fresh, crisp, and everything else that I love about bubbly with a Mediterranean temperament. Once the bubbly was passed around, it all started at the end. By this I mean that the first was to be a wine from 1977. For those who follow vintages, this was not one of note most anywhere in the world. I had really wanted a 1977 Cartoixa from Scala Dei as you can still find the 1974 and 1975. But, given that my birth year is of a scabby vintage in wines, they didn’t make the wine that year. 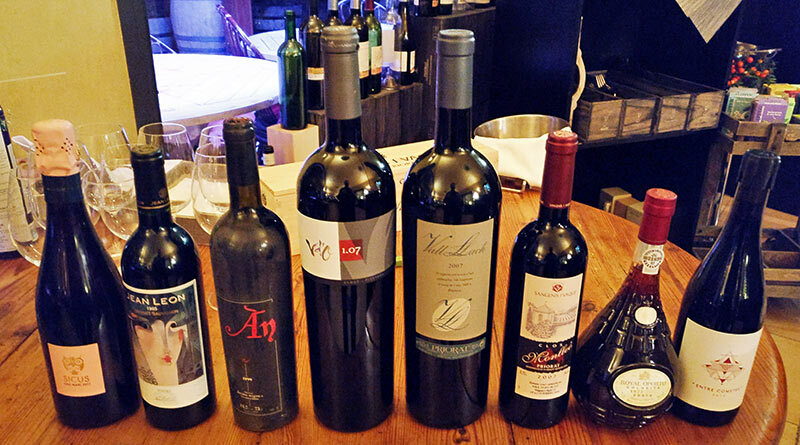 There are two wines that stand out for this vintage: Barolo and Port. Barolo was out of the question both for the price, as well as the effort in finding it as delightful as a trip to Piedmont would have been for such purposes. 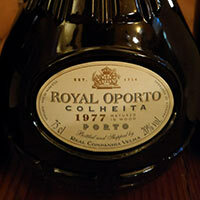 So, Port it was, a vintage 1977 from Real Companhia Velha which editor Èlia had craftily searched out when in Porto last summer. Vintages in Port, like Champagne are not commonly “called” and Port is typically a blend of many years, each boosting part of the resulting wine. There are maybe 3-4 vintage years per decade, but 1977 was one of the finer ones and this wine was indeed beautiful. Raw and sinewy, the moment its raisiny aromas rose up out of the glass to its fine, full body with perfect balance and citric notes. It wasn’t overtly alcoholic, nor sweet, nor anything out of whack, just perfect. Of course, we didn’t appreciate it as much as we could given that it was the final wine of the night. 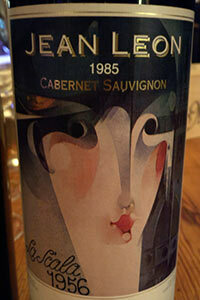 From there, we turned back to the eastern side of Iberia for the 1980s with a bottle of Jean Leon La Scala. 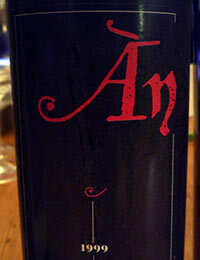 This is a 100% Cabernet Sauvignon wine and is now one of the Vi de Finca wines. I had initially really wanted a 1987 but even calling upon my contacts at Torres (the parent company of Jean Leon) yielded no results as it seems to be scarce. In putting out the word, one of the people in attendance at the meal was able to come across a 1985 that had been bought seven years ago when the winery had apparently re-corked the wines. So it was this vintage that we had and I decided that it should most definitely be decanted as initially it was tight as hell. But slowly, it opened up still revealing light primary fruit aromas, plum, and this signature chalkiness that you don’t really find in other Cabs as they grow theirs in Penedès where the soil type is quite common. Quite a stunning wine once it fully showed itself. The 1990s presented another problem despite not being so long ago. I was hoping to see if my friend Albert Costa had a 1997 Cims de Porrera as he had pulled out a 1996 a few weeks prior. He reported back that was sadly not in possession of any 1997 bottles but instead brought a 1999 from Son Negre on Mallorca called, l’Ànima Negra. 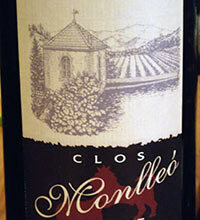 Made of only grapes native to the island, it’s 95% Callet along with 5% Mantonegre and Fogoneu. I’d tasted the 2004 in a past Tast del Decenni and didn’t much care for it. This bottle was an entirely different beast. Light red cherry notes, it simply danced on the palate, light and nimble, not at all blustery and thick like some of the island wines can be. Definitely a winning bottle that one. So then we arrived to the 2000s which, especially with 2007 are no problem to find. Why? Because it was an excellent vintage but beyond that, it was also the height of the last economic bubble as the World Financial Crisis came to head during the 2008 harvest and supply started to fall apart rapidly. So, there’s a lot of 2007 out there still and it’s very fine wine. From up in DO Empordà, I brought a magnum of Vinyes d’Olivardots Vd’O 1.07. This impossible to remember name is an old vine, 100% Carignan plot on slate soils. So, it’s not much different from what you find down in Priorat although the taste profile doesn’t immediately let that on. Floral and violet with cocoa and a mix of red and dark fruits, it’s a beautiful wine that had been lovingly stored at the winery where I bought it directly. It’s no wonder that a modern day version of it was voted a co-best wine for Catalonia in 2016. Then we came home and Priorat went out on the table offering a wondrous contrast from the Olivardots bottle as my friend Maria brought a bottle from her family winery called, Sangenís i Vaqué which was their top-end Clos Monlleó in magnum format. 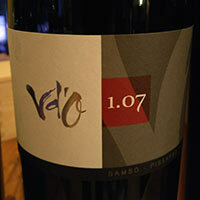 It’s a 50/50 blend of Grenache and Carignan that offers up the best of both grapes. In this case (and if I remember correctly) the Grenache seemed to be a bit more dominant despite the fact that the Carignan was still boosting it with solid acidity. 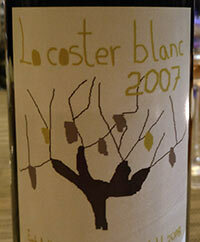 It’s worth noting that Maria tucked in a bottle of a 2007 white wine that I didn’t even know existed called, Lo Coster Blanc. I was under the impression that they’d started making it only in 2012, but there it was and despite being 10 years old, it still had plenty of vibrancy. The acidity was chugging along without a problem and (if memory serves) the White Grenache that makes of the majority of the blend was still absolutely solid showing that while Priorat doesn’t have a lot of white wines, those that it does, are solid wines. 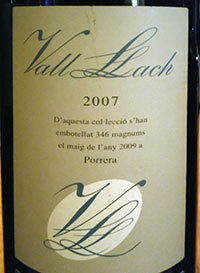 Then we came to the last aged wine of the evening, the Vall Llach – Vall Llach 2007. Albert brought this as well and it appears not to be outdone by the Vd’O, it too was in magnum form and we were all the better for it. Vall Llach makes classy wines and 10 years ago, this wine hadn’t yet been split in to the two wines it exists as today: Mas de La Rosa – Vi de Finca and Porrera – Vi de Vila. This is an interesting item on its own, but even more so is the fact this was the most blended of all these 2007 reds that were presented with 70% Carignan, 15% Merlot, and 15% Cabernet Sauvignon. 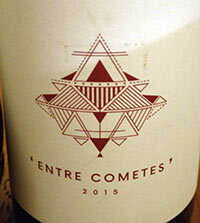 The touch of Frenchiness has given some solid legs to the wine and it showed splendidly. I am of course ridiculously spoiled and Albert treated a group of us in the local press to a vertical tasting of almost all the years of this wine and the 2004 nudges out just a bit better than the 2007, but only a little and there were no complaints in regards to how fine a wine this was. Unsurprising that its modern day relative, the Mas de la Rosa was the co-winner of “Best Wine in Catalonia” with the Vd’O from above. A friend of mine named Cesc was at the dinner as well and has a small project of his own in DO Montsant. He brought a bottle of his young wine which is majority Grenache with a little bit of Syrah from 2015. It seemed fitting to have it in there as we just started 2017, 2016 is too young to drink and so, why not have some 2015? Despite being youthful, it showed well and again illustrates just how important it is that people not dismiss the wines of Montsant. I suppose this actually made it a five decade tasting of wines, but lets not mention that as it makes us all seem older than we already are. Naturally the big question that anyone who has dutifully read to this point will ask is, “Dear god, did you drink all of that in one night?” The simple answer is that no, we didn’t. That would have been Crazy Town. We tasted everything and indulged more in some than others but when you have two magnums set out upon the table, finishing them all is suicide. Thus, the days after the dinner and thanks to the cold temperatures in January, we’ve had them stored in a back room to be worked upon slowly. The Port can thankfully last a bit longer than the dry wines so it is still sitting around, being lovingly sipped upon until it will exist no more. For anyone who loves wine, taking on such an excursion isn’t so much to indulge in gluttony and excess but to see what has happened over the decades and how these wines have aged. This night during this cold winter was a most happy adventure through a scant snippet of humanity’s winemaking history, but it was a most enjoyable one nonetheless.